Concept truck features a 2.8-liter Cummins Turbo Diesel engine. GM will be muscling back into the small pickup truck segment this year, by reintroducing its Chevrolet Colorado and GMC Canyon models. That move will put the sales squeeze on the two remaining models in this shrinking class: the Toyota Tacoma and the Nissan Frontier. Nissan Frontier Diesel Runner makes its auto show debut. 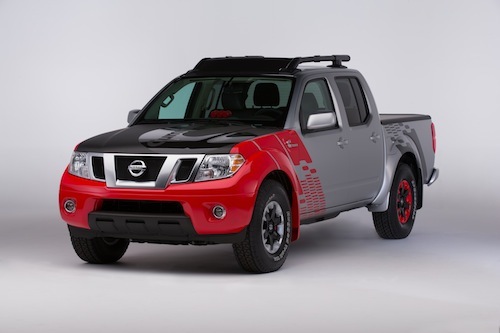 Perhaps seeing that its position among entry-level pickup trucks is the most threatened, Nissan has unveiled a concept Frontier Diesel Runner truck at the 2014 Chicago Auto Show powered by a 2.8-liter turbo diesel engine. The engine comes courtesy of renowned engine maker Cummins, a long-time supplier for Ram pickup trucks. Answering with a turbo diesel may help Nissan preserve its place in a segment where Toyota currently has 68 percent of the market and Nissan the remaining 32 percent share. Both automakers will lose points when Chevrolet/GMC jump in, with Nissan perhaps most vulnerable to being overtaken by GMs twin pickup trucks down the line. Nissan is showcasing the project truck to gauge customer interest in the model. Further, the company says that they are also plotting a potential future direction for the Frontier. Special themed graphics mark the Nissan concept. Last year, Nissan announced a partnership with Cummins Inc. to obtain a 5.0-liter turbo diesel for its full-size Titan pickup truck that will arrive on the market sometime in 2015. 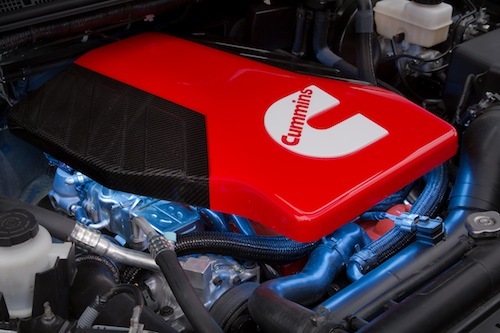 Although Cummins has long had a relationship with Chrysler (Ram) that hasn’t precluded this Indiana-based engine maker from entertaining other partnerships. The Nissan Titan is by far the slowest selling of all large pickup trucks a new design and the diesel engine offering should enable it to boost sales. Frontier continues to be a huge success story for us, with more than 60,000 units sold in 2013, said Fred Diaz, senior vice president, Sales & Marketing, Parts & Service, U.S.A, Nissan North America, Inc. (NNA). Nissan has always valued the mid-size pickup segment, and with this technical study project, we are looking to explore what is possible for the next-generation Frontier. We are always looking for ways to engage our customers, innovate and take the segment in an evolutionary direction. The rear-wheel-drive project truck is powered by a 2.8-liter four-cylinder turbo diesel engine and is paired with an 8-speed automatic transmission. The engine makes an estimated 200 horsepower and 350 foot-pounds of torque and should deliver a 35 percent increase in fuel economy over a similarly equipped gasoline V-6 model. Cummins, one of the most recognized names in diesel engines. A number of styling characteristics in the Diesel Runner are also found in the production Frontier Desert Runner including the body, wiring harnesses, and the radiator. Additional modifications include custom paint treatment, carbon fiber film accents, mesh grille, chin spoiler, roof rack and an aerodynamic tonneau cover and tailgate spoiler. The concept truck is also outfitted with red accents throughout the interior and carbon-trimmed seats and panels. Carbon-print leather appointments with grey accent stitching and black-on-black Tracks embroidery cover the seating surfaces. Red-tinted gauges and a special black-faced diesel-specific three-gauge pod on top of the C-cluster dominates the carbon, film-wrapped instrument panel. Its California and Japan design teams also added embroidered floor mats as well as a shifter knob and steering wheel that complement the truck’s theme. 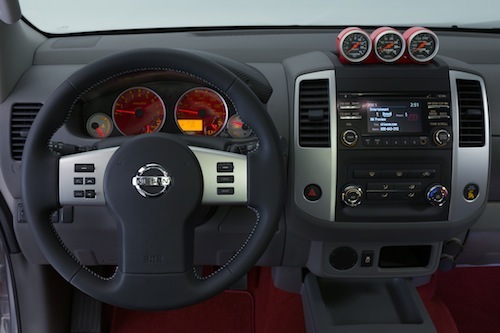 Red accents are found throughout the concepts interior. 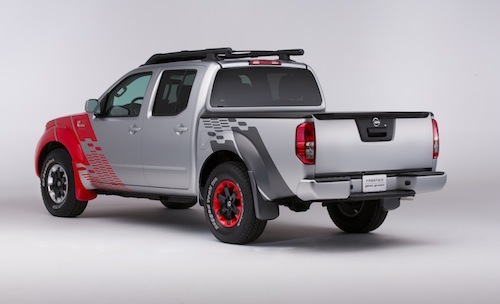 The Nissan Frontier Diesel Runner will be on display for the entire public run of the Chicago Auto Show running from Feb. 8 through Feb. 17 at McCormick Place. In the meantime, Nissan and Cummins also have a separate development vehicle that is currently being put through the paces, undergoing real-world testing to see if it passes muster. With a diesel option, Nissan would match the Colorado engine for engine, itself making available a 2.8-liter turbo diesel from Duramax, GMs joint engine venture with Isuzu. Frontier Diesel Runner photos courtesy of Nissan.